Her client's guilt, however, is only the beginning of Judy's problems. The Coluzzi family wants revenge, and they are determined to finish off Pigeon Tony and Judy before the case can go to trial. ©2001 Lisa Scottoline (P)2001 HarperCollins Publishers, Inc. This was a great book on two levels: First, it had a wonderful grasp of a period of history (something I'm beginning to really count on Scottoline to provide), and second, a really moving story with characters you couldn't help but connect with. Tony - or Pigeon Tony, after his habit of raising racing pigeons - willingly admits to having killed, but not murdered, a man. Both are in their eighties, and are on either ends of a vendetta spinning back to their youths. Judy Carrier, one of Scottoline's characters from the Rosato and Associates firm, is representing him, and incredibly conflicted: how do you defend someone against murder who admits to the killing? And why does she want to? I actually got choked up at passages while listening to this, and surprised myself with a few sniffles. The story, which moves back to the days of fascist Italy in Pigeon Tony's recollections, unfolds two plot lines at once, and the result is a clever intersection. I really enjoyed this - I've enjoyed all of Scottoline's books - and definitely suggest it for your listening pleasure. Rosenblat's naration is first-rate. Giving each character a voice of their own, and lending an appropriate tone to the dialogue. This was truly a joy to listen to. A book that will make you think about murder and killing in a whole new light. One that will make you ask yourself the questions, does killing someone always equal murder? Does killing by one's own hand mean justice is done? Scottoline's flipping back from the past to the present will have you on the edge of your seat and eager for the next plot twist... Before long, you'll be hanging on her every word. It's very well read and fun to listen to, with lots of accents and different voices achieved by a single reader. The plot is lightweight and insignificant but it was a good book to listen to when I walk or drive. This is one of Lisa Scottoline's older books -- 2004. I've read at least ten of these books and enjoyed them all. This was my first audible Scottoline, and I was really looking forward to it -- this is one of the books I hadn't read. I don't know if Barbara Rosenblat narrates them all -- I'll have to check -- but she had problems with this one. First of all, she's eating something throughout the whole book. That's so unprofessional I can't get my mind around it -- okay, so maybe it was just a lozenge or mint or chewing gum or something, but it ranges from merely annoying to downright disgusting. And of course its one of those things that when you've noticed it, you become aware of nothing else. But not so in the audio edition. Here, the narrator turns Judy's gushing enthusiasm into something that become embarrassing. Most adults don't have such unparalleled faith in, and devotion to, the law, as such. Most of us are all too aware of its shortcomings. So hearing Judy endlessly wax lyrical over the nobility of the whole thing, in such worshipful tones, comes across as borderline stupid. It's not pleasant. Scottoline's books frequently deal with Italian Americans -- another thing I like about them, for obvious reasons. She gets the culture exact right -- I hear my relatives in her words, I picture the scenes, recall my own family. It's something I really love about her books. But here, the way the narrator portrays "Pigeon Tony", a frail, elderly ethnic Italian, the Italian-American thing becomes painful, patronizing at best, humiliating at worst. Constantly referring to him as "cute" -- something I probably wouldn't notice in the written version -- but here, with Rosenblat's special emphasis -- "cute" grates on my nerves. He's a grown man, for crying out loud. A man who has survived horrors few of us can even imagine and yet he still managed to escape, to live and survive in a very foreign country, living a productive and worthy life. Now in his old age, he shouldn't be dismissed as "cute" -- the same word that's also applied (with exactly the same emphasis) to Judy's new puppy. That's not nice -- and the whole thing is made worse by Rosenblat's over-the-top Italian accent. Sheesh -- it's a disrespectful caricature that starts to hurt after a while. Do Italians really sound that stupid? An hour in, I decided that I need to go find a paper copy of this book and read it, and see if it was Scottoline who missed the mark in this one, or if it was all the narrator. I think the latter, because the story line is excellent and worthy of attention. I may try another Audible Scottoline, if I can find one read by someone other than this narrator. That "eating" thing just drives me nuts -- I won't willingly put up with another book read by a narrator talking with her mouth full. 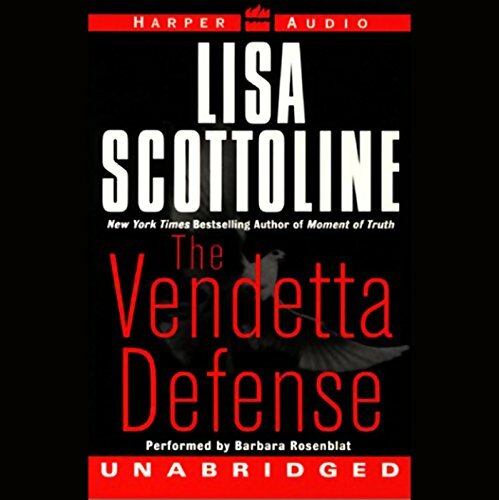 What did you love best about The Vendetta Defense? What other book might you compare The Vendetta Defense to and why? Any Lisa Scottoline book would compare, with a different narrator. What didn’t you like about Barbara Rosenblat’s performance? The narator was distracting, at best. Her deep breathing, augmented by the sucking and chewing sounds, was a distraction from what could have been a truly enjoyable book. My preference would be a narrator who reads without sucking hard candy, chewing gum, or eating a submarine sandwich. She did do a decent Italian-English accent. The drama drew me in. I had to listen until the end, in spite of the narrator. This is Lisa Scottoline and Barbara Rosenbalt -- what an unbeatable team! -- at their very best. I've listened to it twice, which is once more than I ever listen to an audiobook. In about six months, I'll listen to it again. Just marvelous! This is the best audiobook I have listened to! I find her books easy to listen to and interesting to read or hear. The protagonist, an Italian immigrant who loves pigeons, is one of the most sympathetic characters ever defended. Judy Carrier takes the case pro bono) and has a VERY difficult time trying to defend this small and seemingly simple man for murder who keeps blurting out his crime! What is the law compared to justice? (Never a clear line.) This is a great look into above noted community where the MANY "Tonys" (known by their nicknames) and how they stick together to help a neighbor. Judy Carrier has the same many comic thoughts of any Scottoline character that keep you smiling until you breathlessly await the verdict of the obviously guilty "Pigeon Tony."